In a saucepan large enough to hold the chard, heat the olive oil over a moderate heat. Add the lemon zest and leave to bubble for 1 minute, then add the sliced garlic, chilli, rosemary and caraway seeds. To serve, grill the sourdough and rub with the cut sides of the halved garlic clove. 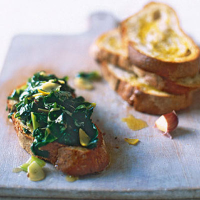 Spoon over the braised chard and its juices, with a little extra virgin olive oil.